A thousand Nebraskans turned out at 10 AM on Friday for a rally for conservative Senate candidate Ben Sasse that featured former Alaska Governor Sarah Palin and Sens. Ted Cruz (R-TX) and Mike Lee (R-UT). Sasse, the anti-Obamacare candidate who has surged in the race, also rallied with former Nebraska Governor Kay Orr, the first female Republican governor, at Scout’s Rest in North Platte, where Orr brought President Ronald Reagan in 1987 to campaign on her behalf. 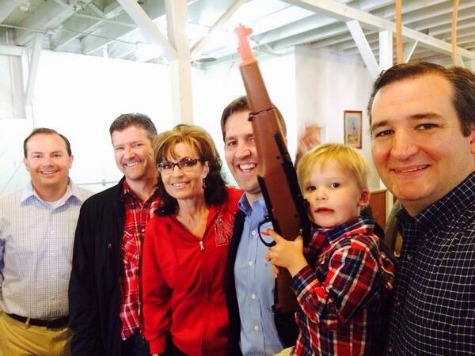 Palin, Lee, and Cruz on Thursday were in Oklahoma to back T.W. Shannon as a candidate who would stand up to the Washington establishment, and they noted that Sasse would be another politician who would provide conservatives like Cruz and Lee some reinforcements in Washington against the permanent political class. “I’m here supporting Ben Sasse because I believe he has the courage to look in the eyes of the party bosses in Washington and say, ‘I don’t work for you, I work for the people of Nebraska,”’ Cruz said, according to the World-Herald. Sasse’s opponent, Shane Osborne, as Breitbart News has reported, has the endorsement of Senators John McCain (R-AZ) and Lindsey Graham (R-SC). And Sasse compared his opponent’s establishment endorsements to Lee’s and Cruz’s endorsements for him. During the 2012 election cycle in Nebraska, the Republican establishment spent millions backing Jon Bruning, while Washington’s conservative establishment, including Freedom Works, spent millions backing Don Stenberg. But after Palin wrote a 135-word Facebook post to endorse Deb Fischer, the then-unknown candidate suddenly had “momentum, buzz, and name identification” and rocketed to the top of the polls en route to wins in the primary and general election. “He’s just the sort of problem solver we need to take on Obamacare and provide a conservative alternative to the challenges facing America!” she said.